On this date in 1962 – the 25th anniversary of the Cole/Roe escape attempt – Alcatraz inmates John Paul Scott and Darl Lee Parker took a shot at busting out of The Rock. After bending the bars on the kitchen window, they made it to the shore and swam for it using inflated rubber gloves as makeshift water wings. Parker made it about 100 yards and stopped on a rock formation near the island. He was found there half an hour after the escape was discovered by prison officials. Scott was found an hour and a half after Parker, unconscious and suffering from hypothermia. He had made it to Fort Point, underneath the Golden Gate Bridge. After a stint in a nearby hospital, Scott was returned to Alcatraz. 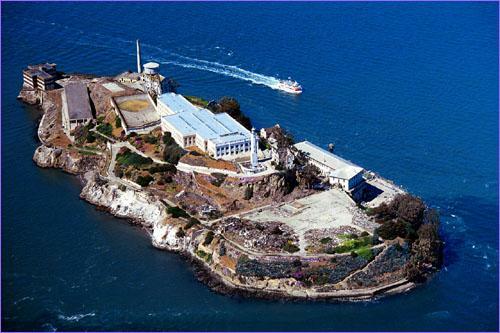 John Paul Scott is the only Alcatraz escapee who ever successfully swam to the mainland… that we know of. 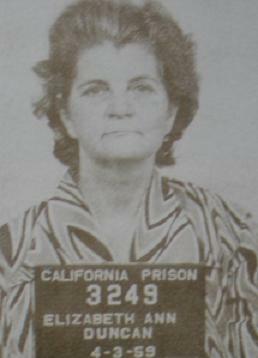 On this day in 1962, Elizabeth Ann “Ma” Duncan was executed in the gas chamber at California’s San Quentin prison. Duncan had been convicted in 1958 for conspiracy to commit murder. She had paid two men, Augustine Baldonado and Luis Moya, to kill her daughter-in-law, Olga Duncan. Olga was seven months pregnant at the time. The two killers beat and strangled her, then buried her in a shallow grave. According to the coroner, she was still alive when they buried her. The elder Mrs. Duncan’s motive was her fear that the impending birth of her grandchild threatened her incestuous relationship with her son. Ma Duncan and her two henchmen were tried and convicted. They were all sentenced to death. Sentence was carried out for all three on August 8, 1962. It was the last triple execution in California, and the last execution of a woman in the state before the US Supreme Court suspended capital punishment in 1972. On this date in 1962, Anna E. Slesers was found dead. 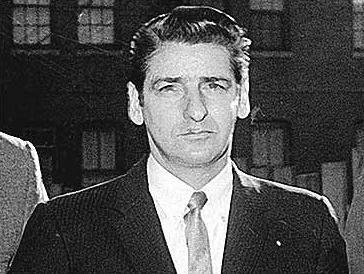 She was believed to be the first victim of the notorious serial killer known as the Boston Strangler, who may, or may not, have been Albert DeSalvo (pictured above). In fact, the murders may have been committed by more than one person. DeSalvo’s confession was the only significant piece of evidence that linked him to the crimes. He died in 1973, while serving time in prison on unrelated offenses. On this date in 1962, Continental Airlines Flight 11, enroute from Chicago to Kansas City, MO, crashed in Unionville, MO, killing all 45 of the Boeing 707’s occupants. Several eyewitness accounts described an explosion at the rear of the plane while it was over Centerville, IA. Once it became apparent that an explosive device might be involved, the FBI was called in. They discovered that one of the passengers had purchased an inordinate amount of life insurance just prior to the flight. In addition to insurance, Thomas G. Doty also purchased six sticks of dynamite before his trip. The married father of a five year old daughter was facing prison time for an armed robbery. Investigators believed that the bomb had been hidden in the rear lavatory on the starboard side of the plane. The explosion tore the tail section off the 707, which caused it to crash. In July 2010, a memorial was erected in Unionville, MO.